You’ve probably heard by now how important content marketing is for building brand reputation and driving organic traffic to your website. It’s no secret. After all, those who use content marketing strategies see six times more website conversions than those who don’t. But, just in case you need more convincing on just how good the ROI on content marketing really is, we’ve compiled some more jaw-dropping statistics for you below. But, before we dive in, it’s important to note a few things. Here’s what it’s NOT: It’s not advertising. It’s not about the quick sale. It’s not easy. Here’s what it IS: It is a way to attract your target audience so they get to know, like and trust your brand. It is a value-based, long-term investment. A number of factors can (and will) influence the overall return on investment for content marketing efforts. Results may vary considering business goals, brand reputation, marketing tactics, promotional efforts, total budget, etc. When measuring ROI on content marketing at CMDS, we believe a one-size-fits-all ROI model is never an effective approach. When it comes to measuring ROI, it isn’t always just about closing a sale. As with any form of digital marketing, brands need to be clear and know what success looks like short-term and long-term. What are you getting for your money? Capturing these metrics can be tricky to the untrained eye, which can be frustrating. To measure brand awareness, we’ll look at social shares of content, brand mentions on social media as well as percentage of website traffic from first-time visitors. Help to measure website traffic related to your content, we’ll look at overall blog page views, time spent on webpages, bounce rates as well as video view length. To measure lead metrics, we like to look at the volume of leads generated directly from content pieces and conversion rates of landing pages. And finally, to measure loyalty, we look at retention by measuring the percentage of visitors returning to a site, newsletter subscription rate, repeat purchasing behaviors and customers’ average lifetime value (LTV). 85+% That’s how many consumers are looking for and reading content from trusted industry professionals, like you. 11 On average, consumers will read this many pieces of content before making the decision to purchase. Quality Blog Content This is the number 1 way to get more indexed pages and links resulting in a wider reach. 3x That’s how many times B2B buyers will visit a website before making a final purchase. 70+% That’s how many consumers feel comfortable buying from a company because of the content they’ve read on their site. 6x+ That’s how much you could save by retaining current customers with quality, relevant content that builds brand loyalty as opposed to finding new customers. As a long-term investment (with long-term results), content marketing requires a different mindset than traditional advertising. But, it can be tough to prove the success of something that may not demonstrate results immediately. As one of the biggest human motivators, “fear of losing out” can be a great way to get the conversation swayed your way. Need to get some buy-in from the powers-that-be? Start practicing your elevator pitch so you can explain how this long-term investment will shake-out: The higher a company’s result ranks on the first page, the more traffic they will get to their website…the more potential for loyal customers, sales…you get the idea. 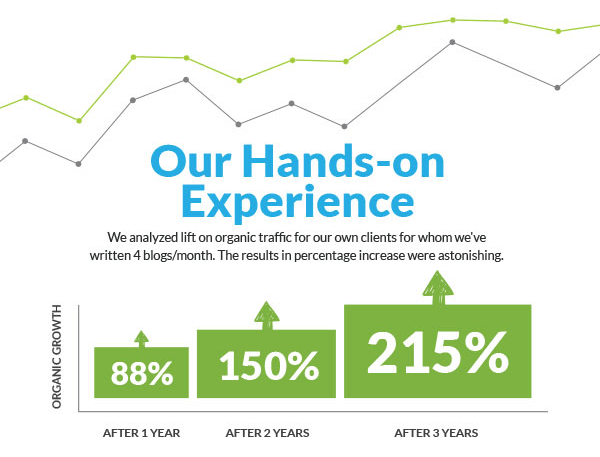 If your businesses isn’t getting the ROI on content marketing you were hoping for, listen up. Share these statistics with those in your business who may need some convincing and start maximizing your ROI with CMDS today. Connect with our in-house content strategy professionals to learn more.